Mustela has developed the Mustela Maternité – a full range of 7 specialist products that are specifically formulated to provide targeted responses to changes the skin undergoes during pregnancy: stretch marks (prevention and recovery), moisturizing and itching, heavy legs, and loss of firmness.It has a dermatologically proven clinical efficacy for each of these issues that assure safety for mom and baby as well as hypoallergenic skincare products that are 100 % compatible with breastfeeding. Mustela guarantees that through a committed environmental-oriented approach, the products are not only effective and safe but they are also practical and pleasurable to use, giving both mother and child a unique sensation of comfort and well-being. And lastly, all Mustela Maternité products contain avocado peptides, a patented active ingredient which relieves sensations of tightness and leaves the skin more elastic, supple, and comfortable. The skin care range consists of products that deal with the most common concerns before, during, and after pregnancy. Stretch marks impact nearly one in two women during pregnancy. Subjected to continuous stretching, the skin develops stretch marks, mainly on the abdomen, hips, thighs and breasts. The Stretch Marks Prevention Cream formula includes a revolutionary patented active ingredient, Galactoarabinan, which come from larch trees, that not only stimulate the synthesis of fibronectin but also that of collagen and elastin, which combat stretch marks. The cream also includes beeswax and shea butter, which moisturizes and nourishes the epidermis, leaving skin soft and smooth. Lastly, it has avocado peptides, a patented active ingredient at the heart of all Mustela Maternité skincare products that relieves sensations of tightness and leaves the skin more elastic and supple. The Stretch Marks Prevention Cream has been proven to prevent stretch marks up to 96%. To complement the cream, mothers can also use the Stretch Marks Prevention Oil which promises to improve the skin's elasticity by 98%. The Stretch Marks Prevention Oil combines Lupeol, extracted from lupine seeds, which is a plant extract active ingredient that stimulates the biosynthesis of high quality collagen, and a bountiful bouquet of 100 % natural precious oils from pomegranates, avocados, rosehips and baobab seeds to nourish and improve the elasticity of the skin. However, for those who were not able to take measures to prevent stretch marks, the Stretch Marks Recovery Serum is specially formulated for both developing and existing stretch marks. It has an exclusive combination of ingredients with targeted effects to reduce the visual impact of stretch marks. One of the ingredients is the Elastoregulator, a plant extract active ingredient that helps regenerate the collagen and elastin fibers that are altered during the formation of stretch marks. The serum also has avocado peptides and other micro-nutrients with healing properties that encourage skin regeneration and also reduces stretch marks. Many women also start to notice that their skin has become easily irritated during the course of the pregnancy, something the Soothing Moisturising Balm is specifically designed for – to strengthen the skin, maintain hydration and prevent itchiness. To combat dry skin, the Soothing Moisturising Balm combines avocado peptides, to relieve tightness and itching, and ceramides to strengthen cell cohesion and maintain skin’s hydration. When expecting a new baby, women are always faced with tough decisions on how to balance work and family life. Some women have demanding careers that require them to return as soon as possible while others opt to stay at home with the baby full-time. Most of the time many try to marry their careers with their family lives by working from home. However, a woman will always choose according to the best interests of her family and the modern mama will never escape the challenge of balancing her work, her family time, and caring for herself. This is the modern mama Mustela had in mind when they created the Mustela Maternité range of skincare products. Modern mama Cat Arambulo-Antonio talks about balancing family, work, and feeling beautiful and a mama of two, going on three, who wears many hats. Beyond being a known blogger and digital influencer, she is also a fashion icon and interior designer. She is known to keep a busy schedule, shuttling to and from meetings for brand collaborations, creating content for her social media channels, spending time with her family, and running her growing household. All this on her plate and yet she manages to resonate a relaxed and positive spirit. One may wonder, how does she manage to do all that and remain all smiles? “In work and in life, I believe in time management,” she shares. “As a wife and a mom, I try to get my work done when my husband is at the office or when my children are at school and asleep. This is so that when they are home, I can dedicate all of my time to them,” shares Arambulo-Antonio, whose roles as wife and mother are high on the list of her priorities and this may be because of how she is able to see pregnancy and motherhood as beautiful blessings. According to Arambulo-Antonio, it isn't that complicated of being a good mother and balancing the different roles she plays in life. She believes women need to make time for themselves. They need to make time to exercise, to stay strong and healthy. They need to pamper themselves and feel beautiful. And most of all, they need to use the right products during the time their bodies are stretched and pushed to the limit during pregnancy and after birth. “I love the Mustela Maternité line. It has everything! The breast firming serum, the light legs gel. While there are some changes that women cannot avoid, there are ways to decrease their effects on the body. I especially love the stretch marks prevention cream and oil. I use them every day! As a modern mama, being able to give the best of yourself to your family and your work is a lot about feeling beautiful inside and out. “You need to take care of yourself,” she wisely advises. “Because if you look good, you feel good too.” she enthuses. The Mustela Maternité products are every mother’s most trusted friend, providing the care and support every woman needs to feel and look alluring, feminine, and beautiful during one of the challenging yet most rewarding times in her life. It is not only clinically effective and safe, but are also designed to make expectant women and mothers' skin feel soft, supple and beautiful. 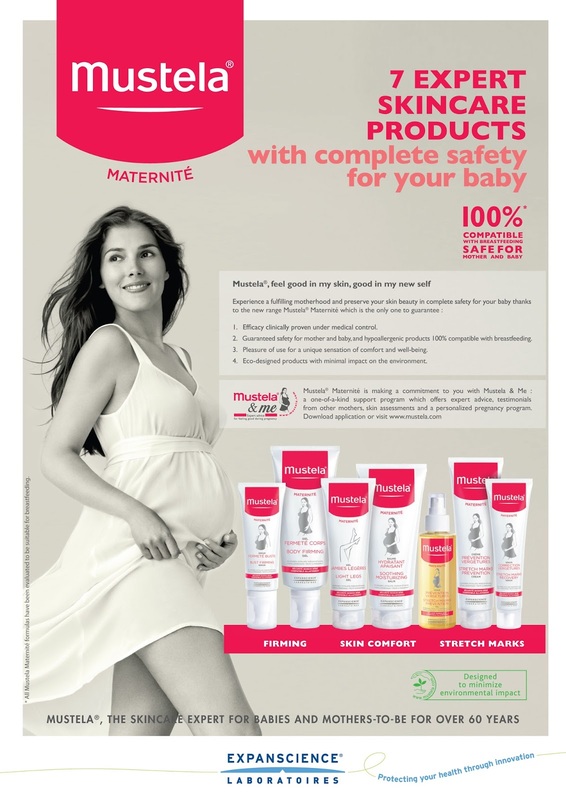 For more information about Mustela, visit their website at www.mustela.ph or www.mustela.ph/content/Mustela-Maternity-range to know more about the Maternité range. You can also follow them on their social media sites: LIKE Mustela Philippines on Facebook and follow @mustelaphilippines on Instagram.